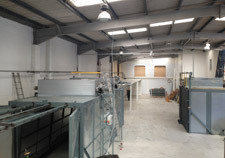 We provide pre treatment solutions PHOS-PREP® for ferrous & non ferrous materials with traditional & eco-friendly chemistries, whilst maintaining quality and performance. 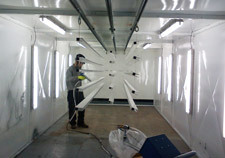 Welcome to Pre Treatment Solutions Ltd Powder Coating Technology. Pre Treatment Solutions Ltd has been offering pre paint preparation technologies over the past 15 years, offering alternatives to the traditional use of high phosphate, & chrome based solutions, with our range of PHOS – PREP® alternatives namely PHOS – PREP®PP 971T & PP 920. 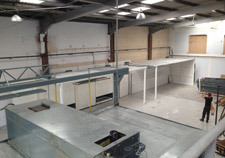 We partner with a company who manufacture powder coating equipment – UK Powder Coating (Bowker Machinery Ltd) who have been serving the powder coating industry for more than 30 years, from their UK factory, based in Glossop they manufacture technically advanced, heavy duty, powder coating equipment to provide powder coaters with the requirements to meet the high-volume demand’s whilst maintaining quality standards. 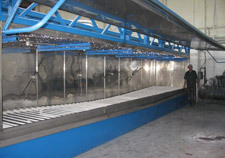 For maximum quality & performance our Auto-Wash machine provides an easy to use solution to allow components to be prepared before powder coating in a space saving unit automatically. 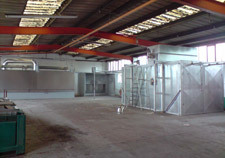 The powder coating equipment in a container is a great innovation for the powder coater lacking the floor space at their factory. 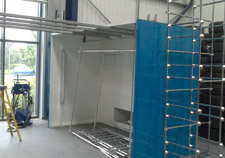 All spray booths come fully prepared and keep the spraying of parts in the factory contained in one area. Centrifugal filters & extraction that capture the over spray & are very efficient, user friendly easy to maintain. 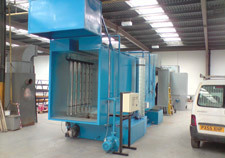 For the smaller application of curing parts such as alloy wheels, with limited painting requirements our electrical oven curing booths are an ideal addition to the smaller powder coating shop. 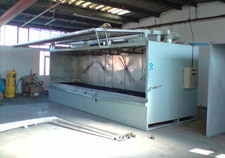 PTS partners with local and internation companies to provide the best solution for your pre-treatment needs.